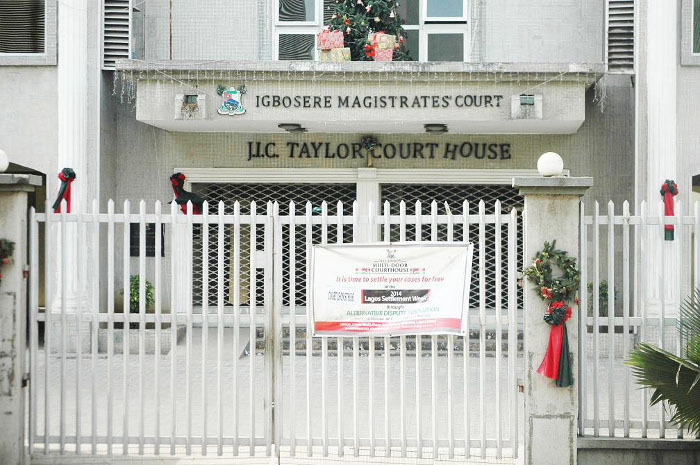 The defendants, Bright Oriakwu and Babajide Akinola, were arraigned on five counts bordering on conspiracy, armed robbery, burglary and belonging to an unlawful society. According to the prosecutor, Tunde Sunmonu, the defendants conspired with others still at large to break into the church and stole mixers, amplifiers and four speakers. Sunmonu added that the defendants also stole from the people in the premises of the church. The defendants were alleged to have committed the offences between November 27, 2015, and December 29, 2015, at No. 4 Ezimorah Street, off Marwa Road, Ijegun, Satellite Town, Lagos. “The accused, while armed with a gun, robbed one Mr Chigozie Orgwu of his HP laptop worth N200,000, two mobile phones worth N110,000, a digital external drive worth N100,000, a watch worth N70,000 and a cash sum of N200,000,” Sunmonu said. He added that the defendants were caught while trying to join an unlawful society, the Eiye Confraternity. The offences, according to him, contravene sections 42 (a), 297 (a), 311 and 411 of the Criminal Law of Lagos State, 2015. The prosecutor, however, urged the court to remand the defendants in police custody and requested an accelerated trial. Justice Adedayo Akintoye, however, ordered that the duo should be remanded in prison and adjourned the case till March 11 and 12 for trial.